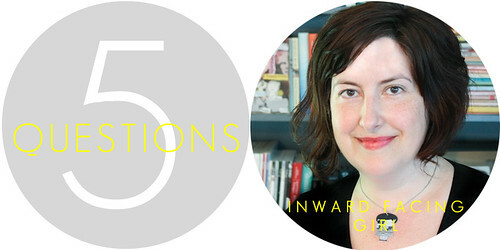 Anyway, it's time for this week's Five Questions post! This week we hear from Melanie, one of my blogger pals who inspires me SO much. Not only is she a great Mom, blogger, and photographer, but she has also recently left her day job to pursue her dreams...so she's really my inspiration these days. Melanie, you amaze me!!! 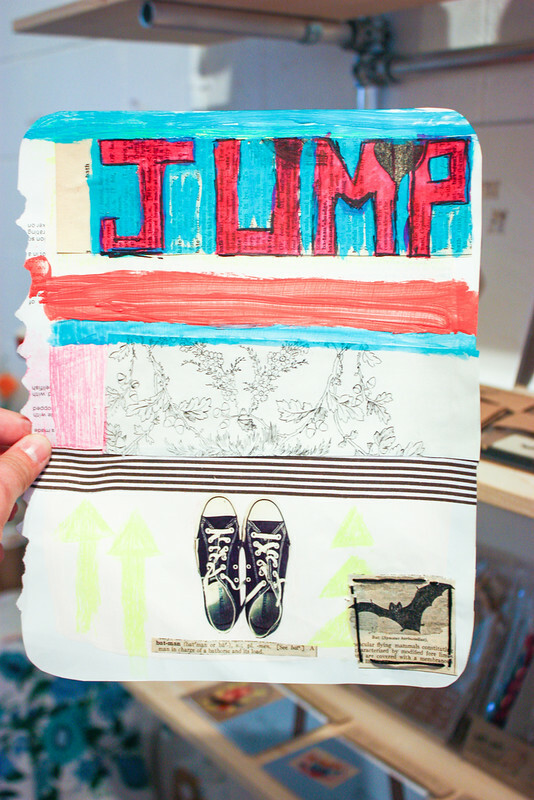 Oh, and she attended Girl Crush Seattle (SOOO JEALOUSSS) and made this amazing collage that is currently on display at Assemble Gallery & Studio, along with the mixed media pieces that the other women who attended the event created. So cool! This was also the day that gave her the last push to resign from her job and pursue her new path. Amazing. Just to note, at the time of this interview Melanie was still with her day job, but she has now made the leap to working full time on Inward Facing Girl. If anyone out there is in need of her expertise, get in touch with her! 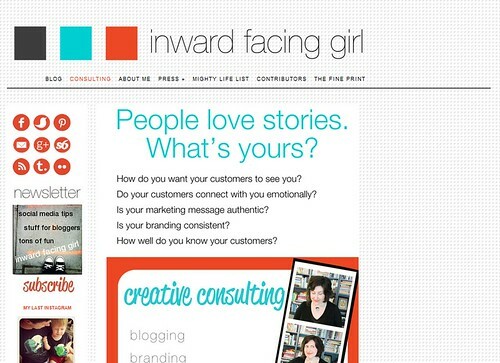 What do you like most about writing Inward Facing Girl? I like that I can say whatever I want and get a response. When you're pitching ideas or submitting articles to magazines, it's typical to get no feedback at all unless they're thinking about/going to publish your piece. On my blog I can write about an idea, share some photography, or "chat" with my readers about something funny and start a dialogue with them. Many of my readers become friends (like you!) which is awesome. I love how blogging builds a community. I'm also glad that my blog isn't about just one thing. It's fun to be able to write about motherhood one day, a cool art exhibit the next, and a trip to Portland after that. Where do you see you/your blog in the next few years? I'll probably be hanging out with Oprah and Gayle saying, "Remember a few years ago when I said I'd be hanging out with you guys? How awesome is that?!?" and we'll laugh, and clink our wine glasses while we're waiting for our spa treatments. I'm in the process of launching my full-time Inward Facing Girl business, which will include freelance writing/blogging, content marketing, social media, and graphic design for creative businesses, so I really hope it takes off and I'm successful doing my own thing. I also would like to be able to get more of my own writing, artwork, and photography out there. How do you find time just for YOU? That's nearly non-existent right now, but I'm hoping to change that after I leave my full-time day job behind. Honestly, my plan has been to schedule an hour or two (UNPLUGGED!) to read books/magazines or make art. So far I think I've done it twice. What’s a typical day in your busy life like? Wake up around 5:00 AM. Turn on coffeemaker. Check email, Facebook, Twitter. 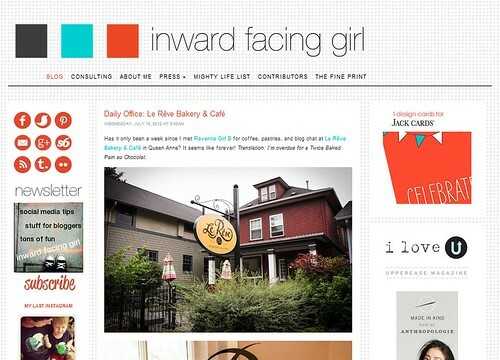 Work on Inward Facing Girl (blog posts, social media scheduling, research). Work on blogging/social media for my client, Bella Umbrella. Spend some time with Nathaniel before he's off to day care. Go to my full-time day job in pediatric behavioral research (yeah...I know!). Do some social media for me/my client while eating breakfast and lunch. Come home. Work on Inward Facing Girl for about half and hour, then pick up Nathaniel. Dinner after Nathaniel's in bed around 8:00. Fall asleep on couch around 10. Drew wakes me up to go to bed around 11:30 or 12. Repeat. Do you have any advice for someone who wants to start a blog/business? Build relationships with people you like. So many opportunities can come from meeting other bloggers. You can do this online of course, but it's also important to put yourself out there and attend area meetups or conferences. Don't try to be the next (insert whatever blogger you love) here. Be yourself and share your unique and beautiful voice. Read the recap posts from blogging conferences like Alt Summit and Mom 2.0. There is a lot of helpful advice out there. What a great interview Melanie! So full of hints and insight. Love it. What a fantastic choice for this series! Love her blog and every word she had to say in your interview. Thanks for sharing, ladies. She's the real deal! 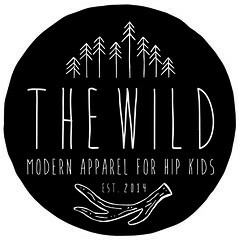 And her blog is one of the first ones that I read every day. Thank you so much Sara! I've been wondering when you're going to stop being so exclusive.